Best Ultralight Sleeping Pad? The Therm-a-Rest Z Lite Gets My Vote. 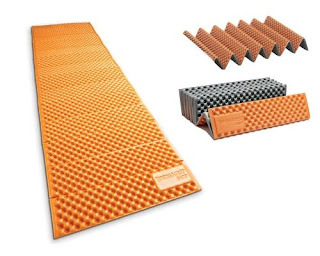 Investing in an ultralight sleeping pad can save a pound or more off your pack weight—and the Therma-a-Rest Z Lite offers one of the best, most durable, most convenient, and least expensive ways to accomplish it. I’ve used the Z Lite as my go-to pad for years—here’s my evaluation of its many advantages, as well as a few drawbacks. The Z Lite is basically a thin piece of closed-cell foam that features a dimpled surface to increase its comfort. It’s unique in that it folds up accordion-style, rather than rolling up like other pads. Folding seams are built into the design, which makes it a snap to instantly fold closed—I can do it in less than two seconds. It unfurls even faster. Just grab the end and toss it out flat. Being able to instantly use the pad also means that I can easily pull it out for use on short rest stops—something I would seldom do if I had to inflate and deflate the pad. Plus, unlike closed-cell foam pads that roll up, you never have to deal with those annoying curled ends when you open it up. The Z Lite is also one of the lightest weight and most inexpensive pads available. The full-length version (6 feet long) weighs only 14 ounces, the short version (51 inches) a mere 10 ounces. It’s cheaper ($45 full-length, $35 short) than an inflatable pad ($60 to $150 or more), though I still think it’s a bit of a racket that Therm-a-Rest can charge so much for what’s essentially just a thin piece of foam. The drawbacks of the Z Lite? It’s much bulkier than ultralight inflatable pads, which often pack down smaller than a one-liter water bottle, making it necessary to attach the Z Lite to the outside of your backpack. It’s not nearly as cushy as an inflatable pad—you’ll need to like (or at least tolerate) sleeping on a harder surface. And it offers minimal insulation. With an R-value of only 2.6, it provides adequate insulation for three-season camping, but falls far short for cold-weather or winter camping. Ultimately, though, it’s comfort that makes the call. If you need lots of cush under your tush to sleep well, the Z Lite probably isn’t for you.